It's very few the times I get to capture events or shoots at the offshore Islands of Puerto Rico. The last time I went to Vieques Island for a wedding was about four years ago. 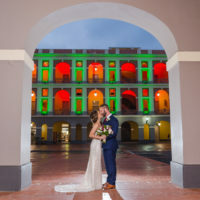 So it was very exciting when this couple called me for their wedding on the paradisiac, one of the best beaches on Earth, amazing travel destination... Flamenco Beach. So after months of planning, a few weeks ago, I traveled for the first time to Culebra Island to capture an amazing elopement. With only eight guests, including our photography team and the officiant, it promised to be an amazing and happy afternoon. We met the day after to do a little rehearsal and walkaround of the beach to determine the exact same spot we would be celebrating the big moment. On the wedding day, we arrived half an hour early to capture the couple getting ready and eventually we walked to our selected spot. It was a perfect day and we had so much fun. Protecting the couple's privacy on their request, I'm only showing a few. Hope you like them!